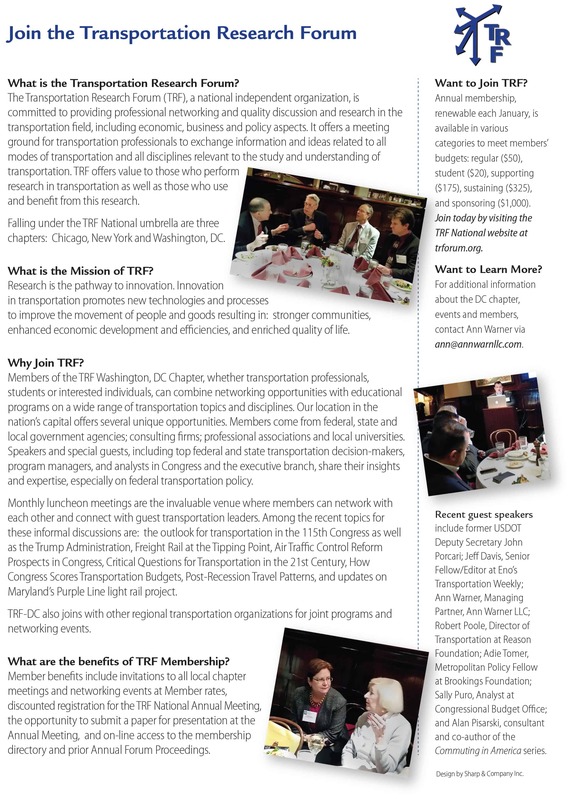 The Washington Chapter of TRF, formed in the early 1960s, draws its membership largely from federal agencies, consultants, trade associations, and local universities. Professions represented include economists, attorneys, engineers, accountants, policy analysts, and others. Membership meetings are held at lunchtime, usually the second or third Wednesdays of the month. Recent speakers include: the former USDOT Under Secretary; former Staff Director of the House Transportation and Infrastructure Committee; senior staff at the Eno Center for Transportation and editor of its Transportation Weekly; Vice-president, American Association of Railroads; and analysts from such major research organizations as the Congressional Budget Office, the Brookings Institution, and Reason Foundation. Topics span all modes – urban, rural and intercity, freight and passenger, domestic and international – as well as policy, technical and legislative issues associated with these modes. Monthly luncheon meetings are held at a downtown restaurant convenient to public transit. The largest meeting of the year is held in January concurrently with the Annual TRB Meeting at a restaurant in close proximity to the TRB meeting site. Dan Dornan, Prince Georges County Govt. For additional information about the DC chapter, events and members, contact Ann Warner.